If we caught anything from recent fashion runway reports, it’s that less is more and more is.. also more. Whether you’re working on a fresh take on natural palettes or a rad twist on vibrant colour, the look is all about what YOU make it. When it comes to this time in the year, we really are like a group of fluffy animals. There really isn’t any other better feeling than when Winter finally comes to an end & Spring begins to a start all over again, don’t you agree? Every Spring, animals start to shed their fur & generally become more active – ready for the Summer takeover. We on the other-hand begin purging ourselves of our Winter nails. Ditching those deep, full-coverage Nail Lacquers and start searching for a completely different nail wardrobe – filling it with a whole host of NEW nail essentials, of course! We definitely don’t have the weather here, but a NEW palette full of Spring hues sure does help us pretend were strolling down a sandy beach. Now the temperature is beginning to increase, there’s no better time to hit the reset button on your manicure/pedicure. 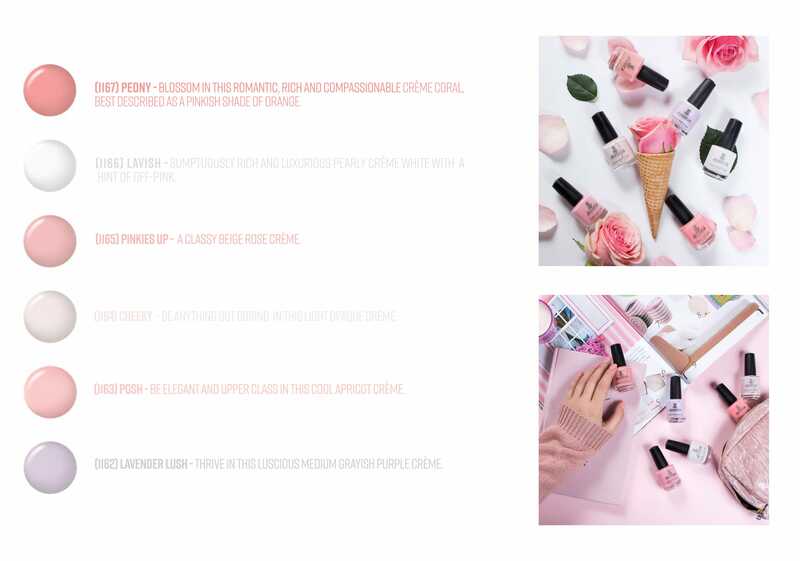 Keep reading to discover a NEW Nail Polish Collection that will give your nails that much-needed spring clean..
Jessica La Vie en Rose 2018 Nail Polish Collection is here, which is taking us to the sunny destination of Los Angeles, California. A combination of six creamy shades including pinks, beige, off-white and lavender hues. These NEW colours are the perfect go-to tones for Spring and heading into Summer. These six shades are sure to lighten & brighten your mood, making you feel positive and optimistic. Jessica says: “Think happy thoughts” with lacquers that express feelings of optimism and vitality. Soft, romantic and charming – this palette is the fresh start to your new year nails. It’s fair to say that La Vie en Rose is seeing the world through rose-coloured glasses. Discover: “Peony” “Lavish”, “Pinkies Up”, “Cheeky”, “Posh” and “Lavender Lush”. “Peony” – A vivid coral crème. “Lavish” – A opaque white crème with a hint of pink. “Pinkies Up” – A dusty rose crème. “Cheeky” – A opaque light beige crème. “Posh” – A warm peach crème. “Lavender Lush” – A iridescent light lavender crème. Although each hand-crafted polish fairly represents the Spring colour palette, we had to pick the one hue that we wanted to be our Hero Shade. Together we decided that it wouldn’t really be Spring without “Peony”, would it? We thought not. In our eyes they were all worthy, but which is your Hero Shade? We would love to know! Tag us in your swatches on Instagram, Facebook and Twitter. Until then, here is how we stepped up our Spring nail game.. Apply two coats of your Jessica Custom Colour under and over your nail sealing edges. Use Brilliance for high gloss and/or a drop of Quick Dry to ensure against smudging. Don’t want to stop reading? Learn about all the latest Spring Collections here.